Product information "Ortlieb Airflex backpack slate-black 11L"
The first trip will prove it: this backpack makes your life lighter! Compact design and 11 liter packing volume make the AirFlex 11 a full featured yet sleek and waterproof pack with convenient roll closure. The Flex-Wire system with comfortable padding offers real carrying comfort. The adjustable compression cord serves for fixing a bike helmet or light jacket. Two outer pockets (not waterproof) offer space for small items which should be quickly accessible. Two reflectors ensure good visibility in the dark. The AirFlex 11 also features a fixing loop for a rear light. + Attention: outer pockets are not waterproof! The manufacturer Ortlieb grants a 5-year guarantee on its products from the date of purchase. This concerns inadequate or incorrect processing of the materials. 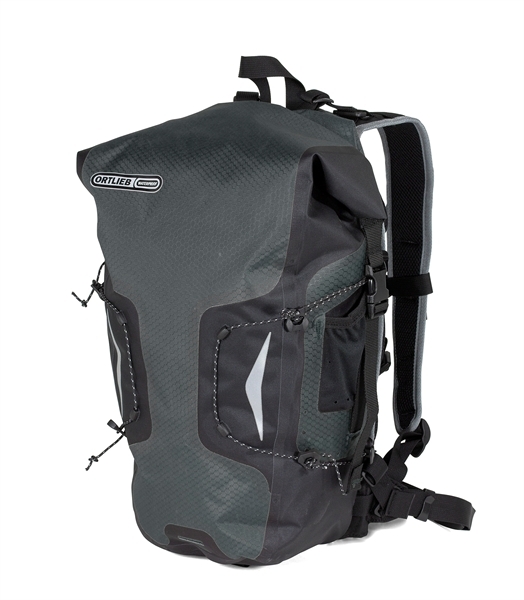 Related links to "Ortlieb Airflex backpack slate-black 11L"
Customer evaluation for "Ortlieb Airflex backpack slate-black 11L"